When Francesca Newell was younger, she spent some years in Kenya and has always dreamed of recreating the safari experience here in the UK. 24/06/15; Monmouthshire; UK. She can’t promise herds of wildebeest or roaming giraffe, but she has returned home to her family farm in rural Monmouthshire to open Seven Hills Hideaway: offering off-grid glamping in luxury, self-catering, tented safari lodges. Taking bookings for dates from 10th July 2015, Seven Hills Hideaway nestles in the foothills of the Brecon Beacons, just 5 miles from Abergavenny, with its famous food and cycling festivals; Monmouth, Hay-on-Wye, Hereford, Cardiff, Bristol and even Bath are all close by. Families, couples, well-behaved groups and dogs are all welcome. The first of seven planned safari lodges, Skirrid Fawr is named after the mountain you can see from its verandah: one of the seven hills surrounding Abergavenny (like Rome!) 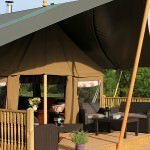 It provides luxury glamping accommodation for six people in three rooms: a king-size double bedroom, twin bedroom and a ‘quirky’, yet comfortable, double cabin bed. Furnished with careful attention to detail in a contemporary, country-chic style; Skirrid Fawr is off-grid enough to relax, unwind and escape, but with plenty of creature comforts and the on-grid essentials for charging mobile devices or running a drying hair. 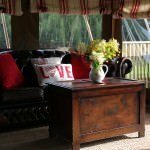 The tented lodge offers spacious open-plan living; a fully equipped kitchen with cooking on a traditional log burning stove (there’s a back-up stove for a morning cuppa); heated shower room and separate toilet / washroom; plus a rear verandah with extra storage space. There’s plenty to do close by, both indoors and out; plus restaurants, cinemas, theatres and rural inns… or you could simply have a sundowner on the front verandah, watch the sunset over the Skirrid and enjoy the areas ‘Dark Skies’ stars. On the edge of the Brecon Beacons National Park – one of only five International Dark Sky Reserves in the world – Seven Hills Hideaway nestles in the quiet, rolling Monmouthshire countryside, but is far from isolated. Guests can ‘stay away from it all’, walking the hills, exploring the valleys, discovering hidden gems; or take in the nearby towns and cities. Located just 5 miles from Abergavenny, with its Michelin starred eateries and famous festivals of food and cycling, Monmouth, Hay-on-Wye, Hereford, even Cardiff, Bristol and Bath, are all within easy reach. Francesca Newell’s family has farmed in this area for six generations, but as a child she was lucky enough to spend some years in Kenya and she loved going on safari… staying in the big tents, under a starry sky, surrounded by nature. Back in the UK now, she has recreated those safari lodges on the family’s 16th century farmstead. These tented lodges are a bit more luxurious than the ones Francesca remembers (glamping hadn’t been invented back then!) and the wildlife is a little less exciting than in Africa, but Seven Hills Hideaway is still surrounded by nature and has the most amazing starry skies. The Seven Hills name reflects the seven hills which surround Abergavenny and each lodge is to be named after one of the hills or mountains. 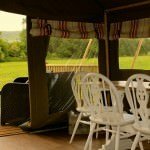 Skirrid Fawr is the first lodge, named after the local mountain you can see from its verandah, and one of three planned for the initial phase; eventually Francesca will offer seven tented glamping lodges spread over two large fields. The aim is to provide a place where people can enjoy a simpler, slower pace of life; a place to relax, unwind and escape from the hustle, bustle and stresses of modern day living. The interior décor is high-end country-chic, with luxurious cotton bedlinen and towels, snuggly down duvets, Ercol furniture and freshly-picked flowers. 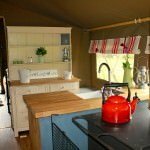 This is still glamping though, so cooking is on a traditional log burning stove and the electrical supply is really only suitable for smaller appliances, although it does run a fridge, which many other sites do not provide. Guests are free to roam the farm and encouraged to explore the fields, wooded areas and streams; maybe even ‘meet’ the sheep and alpacas, with their lambs and crias in spring. The fields and hedgerows are bursting with wildflowers; pheasants, owls, buzzards and even kites can be seen and heard (plus all the usual smaller birds too); and lucky guests may even spot a country fox: they’re far more shy and elusive than their urban cousins! • Mini gas ring for that morning cuppa! • Pre-order chilled or frozen dinner menu, all home-cooked by local chefs. Contact Francesca direct to discuss currently available options.